The Intergovernmental Panel on Climate Change (IPCC) was unambiguous in its special report released in October – we must cut global emissions 45% by 2030 and hit net zero by 2050 or risk an unprecedented global crisis. Meeting a 1.5°C target will require using all available mitigation tools, including the developing technologies to remove carbon dioxide from the atmosphere and permanently store it. Carbon Capture, Utilization and Storage (CCUS) represents a suite of technologies that will help reduce industrial CO2 emissions. There is growing global interest in these technologies, with the Global CO2 Initiative predicting the market for utilization products to be $800 million by 2030. 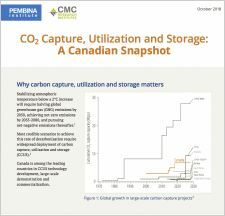 The Pembina Institute and CMC Research Institutes have developed this Canadian CCUS Snapshot that details the importance of these technologies for the climate and the Canadian economy. Canada has world-class expertise in CCUS – we’re already a global leader in the development of such technologies. Four of the top 10 finalists in the $20 million NRG COSIA Carbon XPRIZE competition to find commercial uses for CO2 are from Canada, and we are home to three of the world’s 17 large carbon storage sites. We are also involved in global CCUS development efforts, have world-class academics working to solve challenges, and numerous startups are poised to push their innovations to market. Global average temperatures have already increased 1°C over the mid-19th century with observable impacts that include prolonged droughts, sea level increase, and stronger hurricanes. If temperatures are allowed to increase by 2°C, results will be catastrophic. The development of CCUS technologies hits a triple bottom line – economic growth, job creation and contributing to the reduction of CO2 emissions. Technologies developed in Canada will help the country meet its climate targets and, through export, will contribute to global climate mitigation efforts.